As political turmoil rages, aid agencies are warning of a humanitarian crisis. (CNN) -- Days after a coup plunged the Central African Republic into chaos, looters roamed the streets of the capital, robbing hospitals and preventing fearful residents from seeking treatment. But as the political turmoil rages, aid agencies are warning of a humanitarian crisis as attacks escalate. Violence, looters and fear of the rebels are preventing critically injured patients from going to health facilities in the capital of Bangui, said French medical aid group, Medecins Sans Frontieres. The aid group -- also known as Doctors Without Borders -- said its facilities were raided. "MSF condemns the looting and robberies of our facilities and reminds all parties that medical personnel must be respected and protected and must be granted all available help in the performance of their duties," said Serge St. Louis, MSF head of mission in Bangui. The United Nations, which also said its offices were looted, urged safe and unhindered humanitarian access to victims of violence. About 1.5 million people need assistance, and the number will go up unless aid workers are allowed unlimited access, the United Nations said Tuesday. The most vulnerable are children, who have been separated from relatives and are at risk of being recruited as soldiers, it said. "Those responsible for violations and abuses of international humanitarian and human rights law, including violence against civilians, sexual and gender-based violence, and recruitment and use of children must be held accountable," the U. N. Security Council said in a statement. The nation of 5.1 million has a history of political chaos. In March 2003, Bozize led a coup that deposed his predecessor -- then-President Ange-Felix Patasse. Though Bozize won elections in 2005 and 2011, he did not have full control of the nation. Rebel groups have operated for years, especially in rural areas. 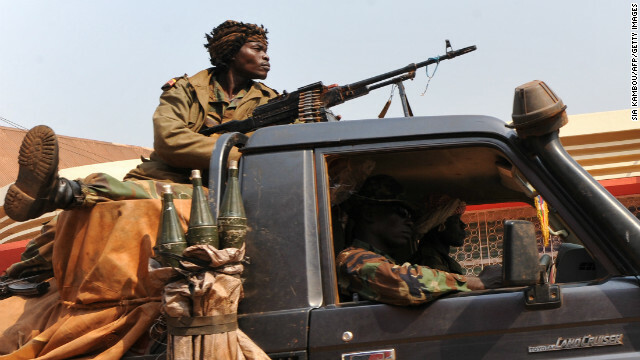 Last year, several rebel groups came under the umbrella name of Seleka started seizing parts of the country. Seleka is a coalition of ragtag fighters, whose popularity was boosted by the discontent against the deposed president. They accused Bozize of reneging on a peace deal, and demanded that he step down. In January, both warring sides brokered a peace deal that included a cease-fire and an agreement to form a unity government led by Bozize. But that deal fell apart as the rebel coalition pushed its way from its base in the north toward Bangui, seizing towns along the way. Their efforts took a pivotal turn Sunday, when they infiltrated the capital, sending the president fleeing to Cameroon.